Galveston Automotive Professionals operates by two basic standards: treat customers well and fix cars right the first time. These standards have been our foundation of growth from a one-man auto repair shop to a 6000 square foot facility that is clean and secure with a professional staff of six to diagnose and repair your car. Today, we’re proud to say we’ve been Galveston’s "mechanics on Mechanic" for 25 years strong. If you want to know whether you should bring your car to G.A.P., ask your neighbor, a colleague at work, or a friend at church. We pride ourselves on our customer referrals, not tricky advertising. Honesty, integrity, and professional expertise make Galveston Automotive Professionals unique in the car repair business. 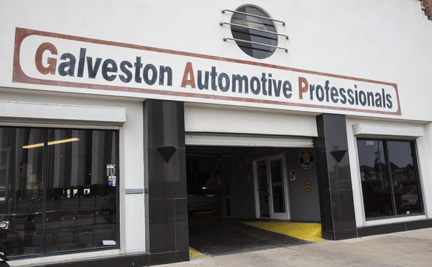 The Galveston Automotive Professionals mission is to treat our customers with respect and honesty, repair vehicles to 100% satisfaction, and offer unparalleled service to those who call on us for their automotive needs. At G.A.P., we like to say we’re "Powered by Customer Service." From maintaining the cleanest auto repair shop in Galveston to finishing every job with a handshake and a smile, our goal is to make your experience with us spectacular. And of course, you can’t be a successful auto repair shop if you can’t fix cars correctly. Our robust crew works together, with everyone contributing their skills and strengths to get the job done. No problem is so great that it can’t be overcome by teamwork. We here at Galveston Automotive Professionals love our island and the history that goes along with it, and we like to think our business reflects the values of our community. We work hard and raise our families, as most Galvestonians do, with integrity, resiliency, honesty, and pride in the unique way of living that comes with calling Galveston home. Our business has grown by word-of-mouth and referrals, and we take pride in taking care of our customers – BOIs and IBCs alike – from all around the Galveston area, including Tiki Island, Bayou Vista, La Marque, Santa Fe, Hitchcock, Dickinson, League City, Bolivar Peninsula, and Jamaica Beach. If you live, work, or go to school here, or if you’re visiting (welcome! ), our shop is convenient to American National Insurance, University of Texas Medical Branch, Texas A&M Galveston, Galveston College, The Strand, Galveston Opera House, the cruise ship terminal, Moody Gardens, and all Galveston beaches. Get Your Car to G.A.P. Today! Our customers trust us to greet them as friends, to have experienced technicians available to diagnose and repair their vehicles, and to ensure that when they drive out the door, they have received the best service possible. Bring your car to the Mechanics on Mechanic Street, and see what we mean. We guarantee you won’t be disappointed!